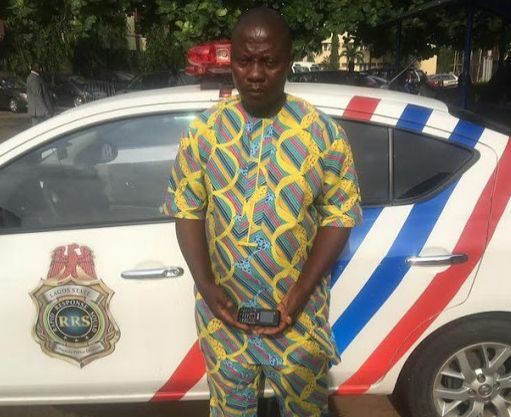 Operatives of the Lagos Rapid Response Squad of the Lagos State Police Command have arrested a man who specializes in recharging call credit from other people’s bank account. The suspect, Ebenezer Oyeneye, a 50-year-old truck driver who resides at 4, Moyinoluwa Avenue, Ijoko Lemode, Ogun State, was arrested by the Decoy team of RRS. It was reported at Aguda Divisional Headquarters in Surulere that one woman who wants to remain anonymous, reported that an unknown person has been recharging their phone call credit from her bank account at one of the new generation commercial banks in the country since July 2016. The victim complained about the frequency and sum of money which the suspect had withdrawn from her bank account by purchasing a credit “top up” which is debited from her account. According to the victim, she noted that the fraud began on the 4th of July 2016, after she received a debit alert from her bank that she had recharged a sum of N1,000 call credit for her phone line without sending such command or initiating such transaction. Ebenezer,whose academic education wouldn’t have alerted anybody from relating such crime to him. He was arrested and questioned on his involvement in the crime by the decoy team of the RRS. He confessed that in July 2016, in trying to make a living after the truck he was driving prior, was retrieved back from him by the owner due to a misunderstanding. With nothing to live on and maintain his family needs. He then found a means of livelihood after trying to recharge his phone line with a short code and was credited N1,000 immediately. I became so overwhelmed by the value of my call credit balance and I immediately resorted to selling of my loot to people around me for months before I was blocked off. He continued, the maximum I can recharge from the account is N3,000 per day because my network provider restrict me to a daily top up of the said amount. I then sell from the proceed and collect back physical cash from my customers. The suspect, a patron of a popular Pentecostal church branch around Otta Area of Ogun State confessed to have been sharing his loot with his wife and calling his mistresses as a big man with so much call credit. When told the amount he had recharged within 11months of his escapade, Ebenezer said he knew he would have recharged up to the said amount (N400,000) because he never gave too much break as he finds it profitable using the illegal platform to enrich himself and be on top of his mobile phone call usage. Commenting on the development, Lagos State Police Public Relations Officer, ASP Olarinde Famous Cole, advices members of the public to seek professional advice from their financial institution before connecting their bank account to any online transaction and report immediately any case of strange activities on their bank account to the necessary authorities.